Mr. Tan and his teacher, Ven. LP Seua of Wat DonPhaiYai. Since a year or two ago there has been some confusion as to why some of Tan’s Ven. LP Seua’s projects are not featured on my SaengThai site. Mr. Tan is a very commited luksit of Ven. LP Seua, whenever there are projects, he will offer himself to help raise funds. Whereas in SaengThai, we can be very picky with our criteria of projects, eg we don’t participate in amulet projects where it is made by 3rd party on the pretext of helping temple. It could be genuine or it could be not or perhaps worked on contributory basis (meaning even if all the amulets were paid and collected, not all the proceeds will be given to Ven. LP but only a portion). Mr. Tan has been helping SaengThai to liaise with some of our members over the years with several projects. He is now building his own Dhamma and Dana group to support Ven. LP Seua, Wat DonPhaiYai, it is a very noble and challenging deed. A difficult task for a noble cause because whenever it comes to monetary implications (approaching members for financial support for temple danas), relationships can be strained. SaengThai also contribute to other temples like in recent Ven. LPu Sukh of Wat Pa’Phromnimit Sisaket , Ven. LP Selood of Wat Kuk U Thong Phrachinburi, Ven. LP Thong Dam of Wat Tham Tapian Thong Lopburi, Ven. LP Pae of Wat PhikhunThong, Singhburi…etc. Resources are limited, so SaengThai has but to pick and choose. It was also due to this, Mr. Tan took the courage to start his own group out of compassion. Ven. 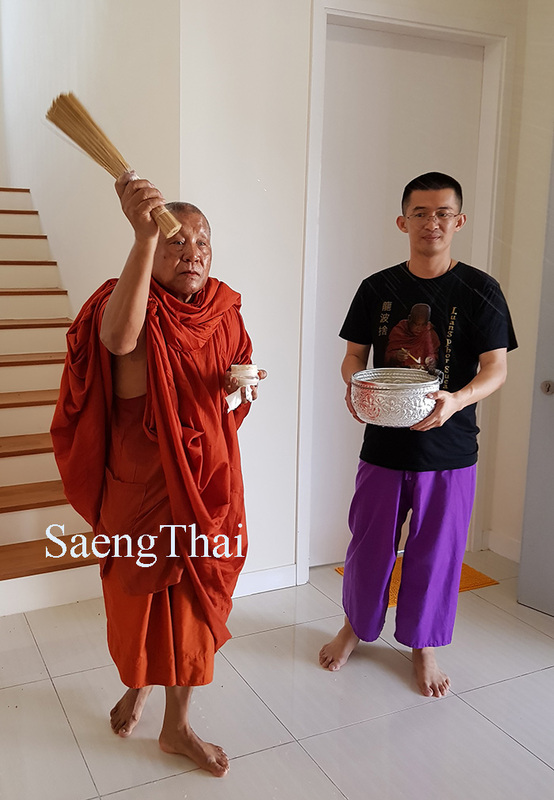 LP Seua love his luksit Mr. Tan much because he is a person of few words and always in action, he always occupy himself with wholesome and productive activities on temple grounds eg sweeping LP Thong viharn or temple vicinities or even assisting Sangha monks in the morning pindabat. SaengThai came in to assist Ven. LP almost a decade ago, then not many will offer their assistance. Ven. LP Seua asked for our support for the entire Ubosot, SaengThai accepted the challenge and by the perfection of The Triple Jewel, Ven. LP Thong LP Seua Thep Aksorn and also our fellow members, Ubosot officially opens to public last December. Now many people claims that Ven. LP Seua is very capable (VEN. LP SEUA IS MORE THAN CAPABLE) and has many foreign support so we don’t rule out the possibility of some people taking the opportunity to cash in on Ven. LP Seua. On the pretext of helping temple to make amulets but only certain portion was given to Ven. LP but they will pocket the rest. Please don’t get me wrong, I do not comment on others’ practise, as long as Ven. LP approves, afterall it is also in a form of Dana. The difference is we owe you all the support and we want to maximize your merits per every RM. But not help others profit from our hard earn money. I hope this posting helps the clear the air on some issues. As we are all on our learning curves, we will all be different with our ways of doing things but very importantly the INTEGRITY of handling to temple your funds is of utmost important. Integrity is a rare gem, Mr. Tan has been a person with integrity with the funds he held before this. We wish him success in all the project he has undertaken to support Ven. LP Seua.